If you have a problematic power window that sticks either full up or full down, or has jammed, there's potentially an easy and cheap fix. Some write-ups on this subject (and service techs) suggest replacing the whole window motor/track assembly (expensive and a major PITA). Upon closer inspection I found this plastic clip (image above) may be at fault. This clip pinches between the glass and the guide rail holder, which in turn runs along the window guide rail via a cable. See image below. 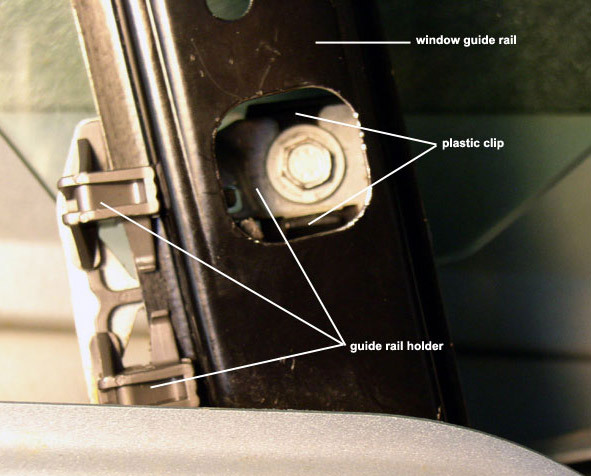 A single bolt (which installs thru the glass) holds the window to the guide rail holder with a nut on the back side which spreads this plastic clip, holding the window in place. The tabs on the back of my plastic clip broke off and were not long enough to spread open and hold the window in place. Concequently, the window slipped off the plastic clip (with a thunk) and jammed the window in its track, causing the motor to stop. The image above shows my defective clip with the short, broken spreaders missing from the back. I see that BMW continues exploring the uses of cheap molded plastic in important places better served by more robust materials. 1) Remove door panel from affected window (many online DIY's for this. Try Xoutpost.com). 2) Locate the now exposed window tracks. 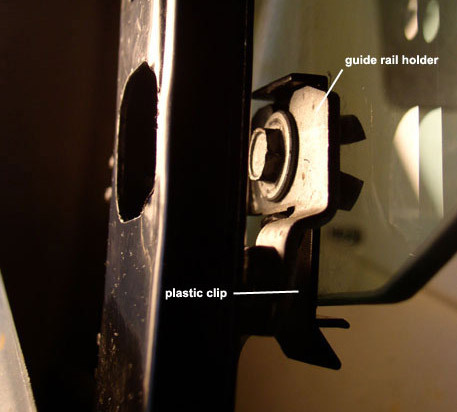 Inspect to determine if failed plastic clip is causing window to slip off guide rail holder. 3) Using metric socket remove guide rail bolt and nut, being careful to catch spreader nut on the back side. 4) Install new plastic clip between guide rail holder and window glass. 5) Re-install bolt with spreader nut (not too tight) and re-install door panel. Inspect the window guide rail holder while you're in there. It also has a plastic element (connecting to the cable) which cracks over time due to the jerking motion of the motor. Mine's cracking. This is also the cause of our window problems, causing the cable to strip thru the holder, resulting in a jammed window. 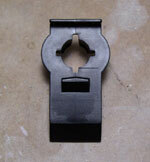 Unfortunately this part is not sold separately and must be purchased with the whole new window motor/track assembly.